I have had eczema since I was around 10 years old. My nan used to make me mittens to wear in bed to stop me scratching. The doctors always told me I would grow out of it in my early teens but unfortunately I still suffer from eczema at the age of 27. For some unknown reason, my eczema has flared up worse than usual since November 2013. 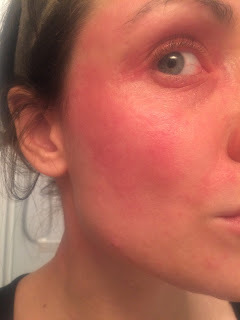 I have red raised patches of eczema on my arms, legs, chest and shoulders, with my face being affected the worst. Here are a couple of photos of my fave. Unfortunately I only have an iPhone camera, so obviously the quality isn't the best and it doesn't show the full extent of the redness on my face but you can generally see that the majority of my face suffers from it and a few small patches on my neck. I can cope with my body eczema as this can easily be covered up, but when it affects my face it can really bring me down and make me self conscious. 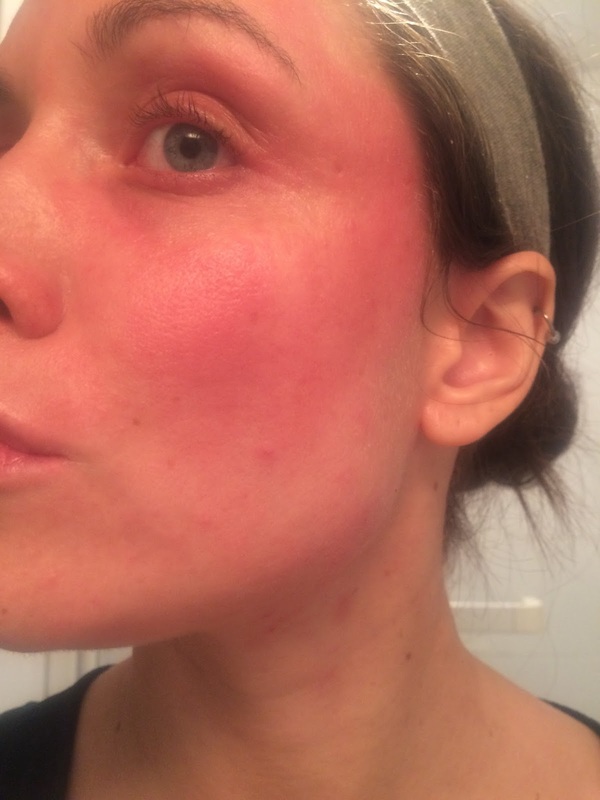 Going out of the house when I have bright red lumpy skin, which usually looks as though I have been burnt, can feel impossible. I deal with clients at work on a daily basis, so it often even affects my confidence with clients too. I have tried various different creams and treatments over the years but I still am unable to find a product that keeps my eczema at bay. After going back and forth to my doctors constantly I decided to ask for an allergy test. My doctor took a blood test and tested me to see whether I was allergic to either - dust, pollen, cats, dairy or wheat. My results came back negative to all of them. They decided to refer me to have a patch test at my local hospital. The doctor fitted around 45 small metal disks on my back. All of which were related to beauty products as that is what they believed I may be allergic to. They even tested some of my own personal products such as my foundation and shampoo. The disks were placed on my back on a Monday and after a quick check up on Wednesday, they were finally removed on the Friday. Unfortunately I only had a 'very minor' reaction to one of the disks and that was for the ingredient formaldehyde, which is found in acrylic nails, nail varnishes and eyelash glue. I decided to cut this product out completely. However, 6 months on my skin was still just as bad. So I don't believe that is the reason for my eczema flare ups! I have been back to the doctor and they referred me to a dermatologist at Solihull hospital but unfortunately they didn't seem to help. I was pretty much just told that 'it didn't look that bad' and that it must be because I had put nail varnish on that my skin was still suffering, despite me going 6 months without wearing any and now only wearing it on special occasions. I basically felt as though they weren't interested. I asked whether they could maybe do another allergy test on me to test whether I may be allergic to anything else, but they refused saying they weren't willing to help. This was a couple of months ago now and my eczema is bad most days! I will keep trying out new products and remedies and will keep you updated as I do!